Modern style is about saving spaces and using natural colors, the designers tended to apply this style on every room in the house even in the master bedroom and they used many ideas to save some space like designing master bedrooms with built-in shelving. So, if you are going to use the modern style in your master bedroom and wondering about the best way to save spaces, we are here to tell you everything about how to have master bedrooms with built-in shelving? It will be with some great walk-in closet ideas where you can also use built-in shelving. It is the time to go modern with your thoughts, I know it is not easy to change but, with some creative ideas, we can convince you to add modern ideas to your master bedroom. Just imagine that you can create a romantic atmosphere in your master bedroom if you light a few candles mounted on a shelf! It will create a soft glow and will prevent starting a fire during a romantic evening. If you plan to use a shelf above the bed, then it is desirable at the repairs stage to calculate the distance from the bed head to the shelves. The optimal quantity of shelves above the bed is only one to two shelves. Most of the time it is only one shelf above the bed, but if you have two built-in shelves above the bed, then it is possible to split the decorations between them. The bottom one could be used for lighting and the top could be used to add decorative items or to be used as a bookshelf. As for the colors, they also have the opportunity to make a bright emphasis on the interior of the master bedroom. The most popular color used with the shelves above the bed is white. White color refreshes the interior, looks simple and concise, and most importantly it fits almost every decoration. The white is neutral and goes with almost all the colors. However, you can use what looks good, such other colors, which are an extension of the interior bedrooms. For example, the shelves can be the same color as the walls and can be contrasted, acting as a bright interior emphasis. For example, the color of the shelves could conform to the color curtains or the sofa color. We talked a lot about master bedrooms with built-in shelving above the bed and it is the time for the amazing option which is the walk-in closet. 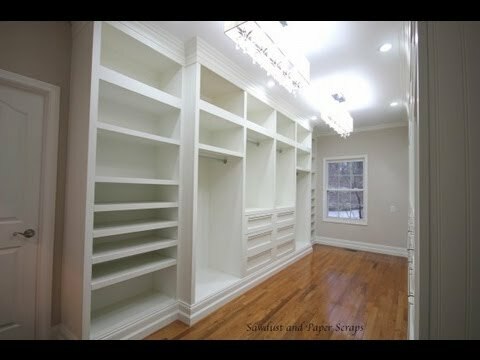 If you were lucky enough to have a sunken wall between two columns that could be used to install built-in shelves which can consist of two parts, divided vertically or horizontally with a mirror in the middle and close this place with a sliding door or even with a curtain, you can easily name it a walk-in closet. It is a simple way to use built-in shelving smartly and leave the old idea of the ordinary closet and have more space in your master bedrooms with built-in shelving. This is one of the best uses of master bedrooms with built-in shelving, Use your room not only to sleep but also as a nice place, to disconnect from the stress of everyday life. A nice and cozy reading corner with a practical armchair, a stylish reading light, and you can use the build in shelves to store your books it is ideal for this purpose. A fluffy carpet and matching pillows make the overall picture perfect. The storage space in the bedroom is an important point that should not be missed. A master bedroom with built-in shelving gives you the opportunity to stow all your clothes and makes your shoes neat and ensures that the room looks visually tidy. Built-in shelving saves space and makes your room appear visually larger. You can use the built-in shelves beside the bed to add some decorating items that fit your master bedroom. the uses of the built-in shelving in your master bedroom does not end, you can be more creative and use it to make study corner, a place to show your memories as pictures in frames, a place to store your make-up if you add a mirror it will be just perfect, and if you were one of those people who do not like to get out of the bedroom to get a drink you can use the built-in shelves to create a nice coffee corner.